Latex paint is used for interior and exterior painting. If you have leftover paint that you don't want, you cannot simply throw it into the trash. This is not only bad for the environment, it is illegal in many areas. You must first harden the paint so that it cannot contaminate local water and soil. There are several ways to do this, but all require very little effort. Dispose of old latex paint properly. Let the paint can sit open until it dries naturally if there is less than an inch of paint at the bottom. This will take a few days, less if the weather is hot. This technique only works for small amounts as large quantities will form a skin on top, preventing the paint trapped beneath from hardening. Mix an equal amount of absorbent kitty litter or sawdust into the paint. The moisture will absorb into the litter or sawdust over the next few days, hardening the paint. Leave the lid off of the paint as it hardens. Mix cement into the paint. You will need approximately 10 pounds of cement for every gallon of paint, along with a bucket large enough to mix the two. This solution is more expensive, but is much faster. The paint will harden within an hour. 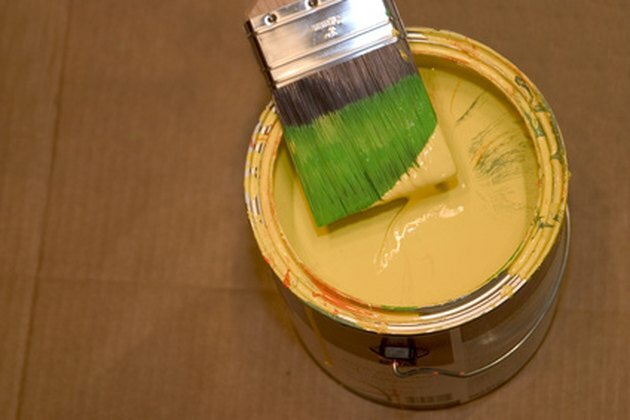 Mix a store-bought latex paint hardener into the paint. These products come in small pouches or bottles and can be added directly to the can of paint. They work quickly with no need for separate mixing buckets. Alex Smith began writing in 2006 and brings a combination of education and humor to various websites. He holds a Master of Arts in theater and works as a professional makeup and special-effects artist. Why Is Gypsum Added to Cement?